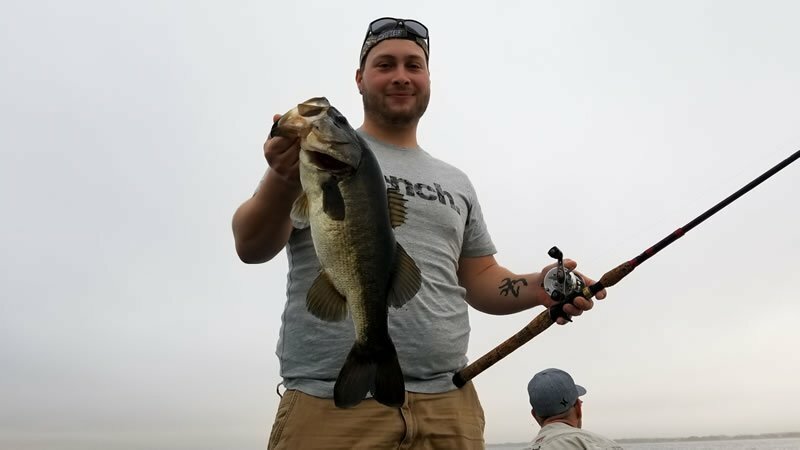 Common Names – Kentucky bass, Kentucky spotted bass, northern spotted bass, Alabama spotted bass, Wichita spotted bass, black bass, smallmouth bass and spot. Description – Is similar in appearance to the largemouth bass. Has green to olive-green hue; white, mottled belly; and a broad stripe of broken blotches, usually diamond-shaped, along the midline of the body. Unlike the largemouth, the spotted bass has scales on the base portion of the second dorsal fin; its first and second dorsal fin are clearly connected, and its upper jaw does not extend past the eye. Above the lateral line there are dark markings, and below the lateral line the scales have dark bases that give rise to the linear rows of small spots which are responsible for the common name. Subspecies – Three are recognized: the northern spotted bass (M. p. punctulatus) has 60 to 68 scales along the lateral line, the Alabama spotted bass (M. p. henshalli) has 68 to 75 scales along the lateral line. Spotted bass can be found from Texas to the Florida panhandle including Georgia, Alabama, Tennessee and Kentucky. The Wichita spotted bass (thought by some to be extinct) is limited to the West Cache Creek, Oklahoma. The Alabama spotted bass has been introduced into California. Range – While widely distributed outside Florida, the spotted bass is restricted to streams of the panhandle from the Perdido River to the Apalachicola River. 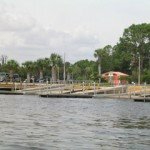 Abundance is limited in this area, but the fish primarily occurs in and west of the Choctawhatchee River. Habitat – Prefers small to medium streams and rivers with clear, slow-moving water, gravel or rock bottoms. Spotted bass may occupy reservoirs, but are seldom found in natural lakes. They do not enter brackish water. 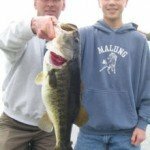 Spawning Habits – Spawns very much like the largemouth. Spawning occurs in the spring when water temperatures reach 60 to 65 degrees. Sexually mature mates build saucer-shaped nests on a soft, clay bottom or on gravel bars generally near brush, logs or other heavy cover. The eggs hatch in four or five days, yielding up to 3,000 fry per nest. Feeding Habits – The principal food items are crayfish, fish and aquatic insects. The species is less piscivorous than other black basses and seems to be more selective in its feeding habits. Age and Growth – Tends to grow slower than largemouth bass and does not attain as large a size as other species. The young grow to 1-1/2 to 4 inches the first summer. Maturity is reached at about seven inches. Average lengths for fish aged 1 to 8 years are 4, 8, 12, 14, 15, 16, 17, 18 inches. Sporting Qualities – Strong fighters when caught on light tackle. Popular lures and baits include jigs, crankbaits, spinners, small plastic worms and crayfish. As a sport fish, specific bag and size limit regulations apply, and you can register a qualifying catch as part of the Florida Fish and Wildlife Conservation Commission’s “Big Catch” program. Eating Quality – White, flaky meat with good flavor. Generally considered better eating than largemouth. World Record – 9 pounds, 4 ounces, caught in Lake Perris, California in 1987.State Record – 3 pounds, 12 ounces, caught in Apalachicola River in 1985.